Most productivity gurus say that when you hit a wall, you should switch tasks. This is how I ended up reading a paper about beavers who managed to hijack a wetland restoration for their benefit. So congratulations! You’re in the right place to learn some fancy philosophy terms and think about wetlands from a whooole new perspective. 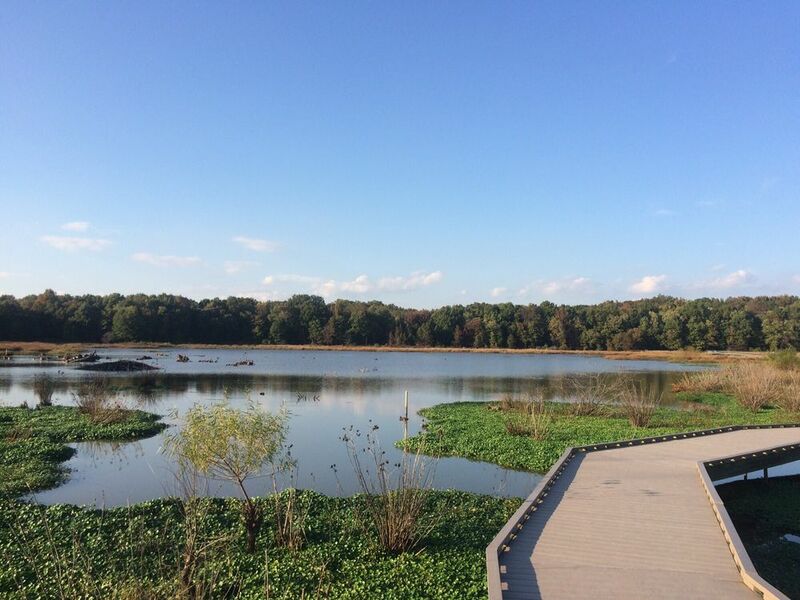 The wetland in question is Huntley Meadows Park, a Fairfax County Park in Alexandria, VA, just south of DC. The 1500-acre park is surrounded by a busy metropolitan area and bordered by I-95, but you wouldn’t know it from the photos. It’s an escape for humans, who give it an impressive 4.5 stars on Yelp, and a habitat for animals, particularly birds, who haven’t figured out the internet yet. (YET.) The park was a hemi-marsh (approximately equal area of water and plants) when it was developed for public use in the early 1980s, but then a storm dropped six tons of sediment on the wetland within 24 hours in 1985. This was a turning point that transformed Huntley Meadows into a marsh that was dry for extended periods of time each year. In the early 1990s, restoration plans began, prompted by a decrease in rare bird sightings coupled with the realization that intervention was necessary to maintain a functional wetland. This is where the beavers come in. Cute- or manipulative? Hmm… Image source. Restoration projects require balancing the needs of multiple users. Those users are typically human communities whose priorities don’t include gnawing down trees. The paper I read about the project turns the typical restoration narrative on its head, describing a “story of power” in which the beavers of Huntley Meadows influenced the restoration as much as they were impacted by it. Author Gwendolin McCrea, a PhD candidate at the University of Minnesota- Twin Cities, uses two philosophical concepts that are very fun to say to set the scene. Dispositif is an idea loosely translated as “apparatus” or “assemblage.” It encompasses all the living and nonliving forces of a sphere- so it includes, for example, government and social mores as well as people and Spartina and beavers. The second idea is umwelt, an animal’s view of the external world. Umwelt strikes me as the framework that makes stories like Watership Down possible: animals are assumed to have narratives of sort as they respond to and navigate the world on their own terms, unaware of human motivations. A view of Huntley Meadows, including the visitor boardwalk. Image source. The overall goal of the Huntley Meadows restoration was to support biodiversity. That sounds ho-hum standard, but as McCrea explains, there could have been other goals, such as hydrologic connectivity, that wouldn’t have emphasized the distinction between the “natural” wetland and its urban surroundings. In Huntley Meadows, though, increasing biodiversity required alternating inundated and dry conditions, and that’s when what McCrea adorably terms “beavers being beavers” became problematic. (I really really hope that Miley Cyrus somehow reads this paper.) Beavers dam stuff! It’s their umwelt! They don’t care that they’re messing with the hydrology or whatever. They just sense water flow and respond in a way that maintains deep water. Proof that people love the beavers! This photo was taken by Daniel B. McNeill, who’d I guess was a park visitor. Image source. Maybe the solution is to kill all the beavers? Nope, park visitors like them and would not be happy. Huntley Meadows also couldn’t outsource them to other local wetlands, who already had their own beaver communities. In philosophical terms, the dispositif wouldn’t permit getting rid of the beavers. 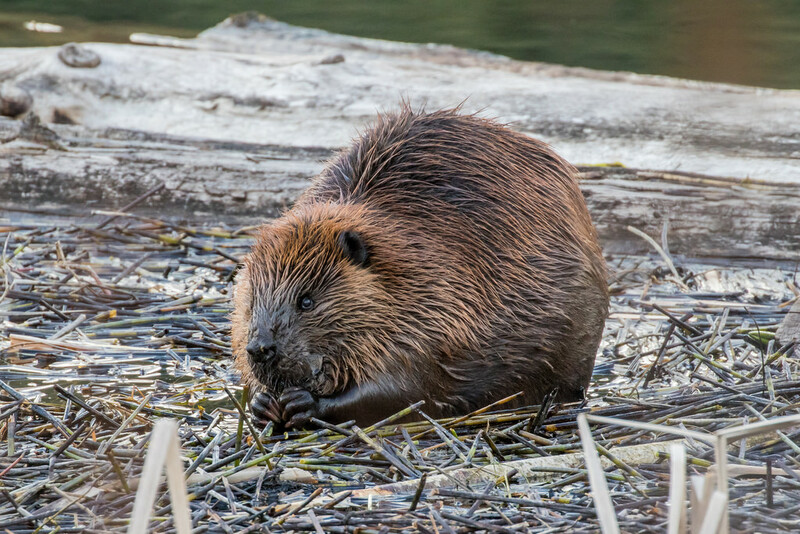 This brought up a catch-22: the beavers had been partially responsible for people’s attraction to the park, but the wetland couldn’t persist with the beavers present. The solution, it turned out, was to “manage beaver behavior without managing the beavers themselves.” A team from Clemson University developed a pipe system that dispersed water flow, lessening the environmental stimulus that would normally prompt beavers to create dams. As McCrea explains, the pipes accounted for the beavers’ umwelt– and exploited it. One problem solved! The beavers could continue to live in Huntley Meadows, building fewer dams and therefore not damning the wetland. 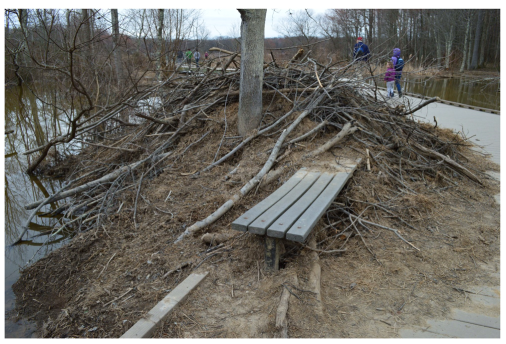 One surefire way to ensure that guests can see the beavers: let the lodge take over the boardwalk. Photo from McCrea 2016. So humans were the power brokers in that scenario, but the tables were about to turn. When planners were designing observation trails, they identified a key value of the dispositif: visitors loved watching the beavers putter around, meaning that the beavers had to be visible for those people to continue visiting. This led to restoration elements designed just for the beavers, including a lodge that encroached on the boardwalk and a stand of trees that was fenced on a rotating basis. In McCrea’s words, the accommodations “enroll[ed] the beavers themselves as an element of the governing dispositif directed toward the creation of environmental subjects.” Translation: the beavers were calling the shots now. This whole narrative could be told from a number of perspectives, of course. I can’t imagine classical ecologists or environmental educators stepping into the shoes of a Huntley Meadows beaver and concluding that they are subjugating humans (ok ok, that’s a smidge hyperbolic). I’m not entirely sold on McCrea’s explanation of the restoration, although that may be a personal limitation: I’m accustomed to thinking about restoration from an ecological perspective rather than a philosophical one. I do think it’s a worthwhile creative exercise to think about a familiar situation from a totally new angle, and when that angle doesn’t involve one sentence about denitrification for a change, this biogeochemist is on board. McCrea, Gwendolin. 2016. Castor canadensis and urban wetland governance- Fairfax County, VA case study. Urban Forestry and Urban Greening 19: 306-314. 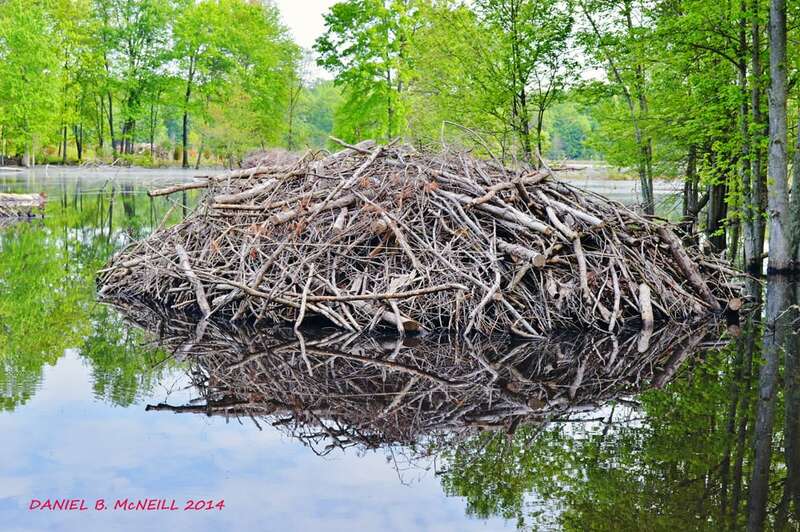 Tags: beavers, Huntley Meadows Park, philosophy, Policy, restoration, Virginia, wetlands. Bookmark the permalink. Previous post ← Thanks oceans! Reminds me of the (unnamed) pond seen from I-80 westbound just past exit 35 in Rockaway, NJ. Beaver dams are noticeable there each year. But I don’t know if they are upsetting some man-made habitat. Oh yeah! I know what you’re talking about. I have no idea what they might be impacting either.